How many times have you felt that sting watching evil seem to get its way? Have you ever considered how God feels about evil? In Psalm 7, David says, “God feels indignation every day.” Not only does God feel righteous anger, but He “pronounces doom” on the wicked. In other words, God is taking care of the wicked for their evil even as He’s taking care of the righteous for their faithfulness. Mordecai waited. Esther acted. Haman plotted. God took care of them all in His righteousness and also in His timing. How much more can we wait and trust God to do the same for us? This truth of God’s righteous nature should be a dire warning to those who shake their fist at heaven and defy God and be an encouragement to those who are honoring God. 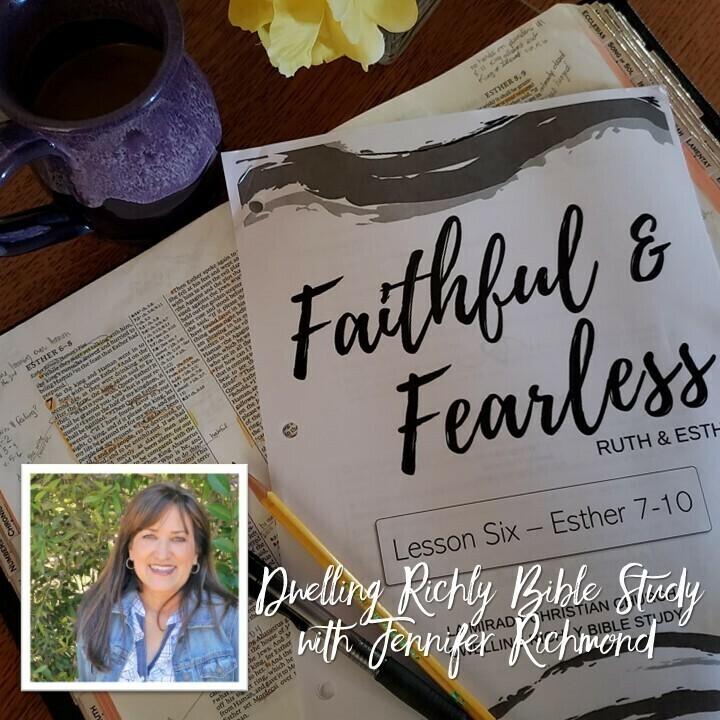 Be sure to join me for the next day in our “Faithful and Fearless” lesson! Share any prayer requests in the comment section below! Reminder: One of the goals of this Bible study is to help you develop skills of a good student of the Word. Read Esther straight through without referring to any study notes or commentaries. Use only the maps and references in your Bible. It may be tempting to read notes or commentaries, but do the work of your own personal study. Pray for wisdom and understanding as you read. Try This: Don’t just read Esther, read Esther aloud. Read it to your spouse or kids or read it with a friend. You’ll find it really changes the experience. Enjoy! Use the line on the left side of the following notes pages to outline the timeline of Esther. Note especially pivotal moments in the narrative. Note in particular, “just so happen” moments – coincidences in timing, placement, people, events, etc. How many times is the name of God mentioned in Esther? Zero. How many times is prayer mentioned? Zero. What about the Temple? Again, zero. How many times has God’s will been stopped? Ah, yes...once again, zero times. No matter who is on the throne; no matter who is scheming; no matter the time we have to wait or the length of our efforts to do the right thing or the efforts of those to do evil, God will have his way. Consider that truth today. Do you feel God is silent? Does he seem to be far off? Like the pagan god Baal, who Elijah mocked as being off on the toilet, does God feel like he’s got a “Do Not Disturb” sign out on his royal doorknob? Rest assured, and actually, do just that – rest. And while you rest, be assured that God is on the throne getting the job done for your best and for His glory today! Amen? Amen! “Pride is the only known disease that makes everybody sick except the person who has it.” (Anonymous). Haman’s would be humorous if it weren’t so sickening. He is not only satisfied with the potential demise of his enemy; he is pleased by it. He, like all who oppose God, seeks to lift himself up to glory while lifting others up to shame. God wants the exact opposite for us. “Delight yourself in the Lord, and he will give you the desires of your heart.” Instead, Haman delights himself in – well – himself. The malice Haman has is like yeast in dough. It thoroughly permeates. Malice in your heart, no matter how much you’re egged on by others, will do the same. Pray that God would reveal any tendency you may have to pridefully seek your own way and to try to get others on your side. Delight in God, not in yourself.